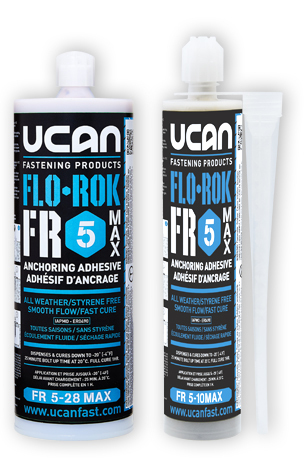 UCAN FLO-ROK® 6 SD is a high performance 1:1 pure epoxy chemical adhesive anchor speci cally formulated for fastening threaded rod and rebar in cracked and uncracked concrete. It is also ideal for anchoring in solid rock and hard natural stone. 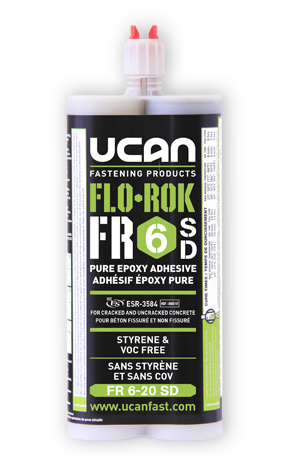 FLO-ROK® 6 SD is suitable for dry, wet or flooded applications and is styrene free and VOC free. UCAN SZ heavy load expansion anchor is a mechanical anchor with controlled expansion that displays exceptionally high tension and shear loads. Available in both zinc plated grade 8.8 carbon steel & type 316 stainless steel, heavy load anchors are ideal for applications requiring a high degree of security and reliability. UCAN TZ torque controlled mechanical expansion wedge anchors have a Category 1 classification. They are used to resist static, wind and seismic tension and shear loads in cracked and uncracked normal weight concrete that has a specified compressive strength of between 2,500 psi (17.2 MPa) and 8,500 psi (58.6 MPa). UCAN TZ wedge anchors are fully threaded, zinc plated carbon steel anchors assem- bled with a unique 3 segment clip. They include a nut and washer and are available in diameters ranging from 3/8” to 3/4”.